These pens sets comes with the option of either red resin or blue resin accented on the gold colored metallic pen. These pens were originally made decades ago and are now on closeout and it is for that reason that are able to pass such a deep discount to our customers. Danitrio has been known as a high quality pen manufacturer for decades. They have literally made hundreds of variations of pens throughout the years. 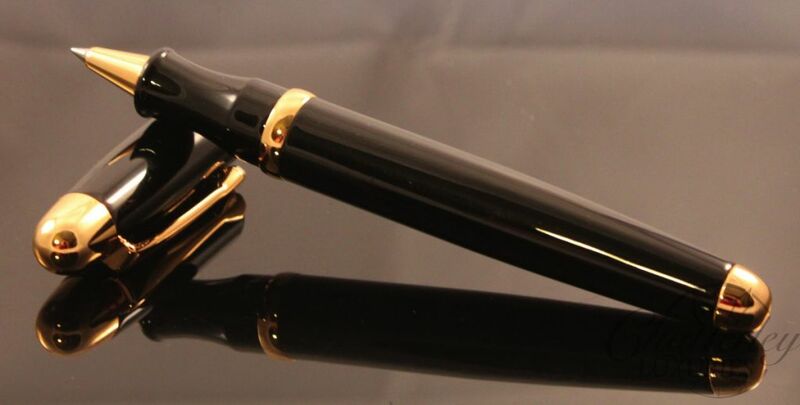 Presented for sale here are matching ballpoint / fountain pen sets that they made over a decade ago and have since discontinued this line of pens. At Danitrio they decided rather to focus on a smaller range of pens, particularly the hand painted Maki-e pens. These pens here have been kept for more than 15 years in good quality. However due to the age of these pens the ballpoints will need new refills which we unfortunately do not sell. The nibs are steel and are a Medium grade, also the fountain pens fill via cartridge.